The Sr. 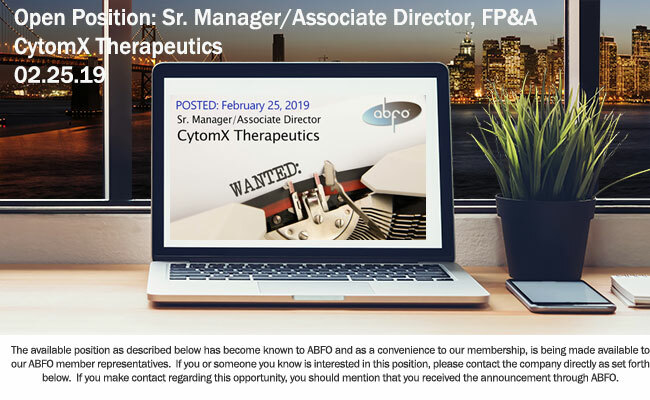 Manager / Associate Director of Financial Planning & Analysis (FP&A) is a newly created position within the Finance department of a dynamic and fast-growing biotech company. We are seeking a collaborative and analytical problem solver to assist the Sr. Director in building and evolving the company’s financial planning, reporting and analysis processes. This highly visible position will be responsible for monthly management reporting and analysis and will be a finance business partner for departments and program teams. This collaborative individual will also coordinate with the Accounting team and participate in month-end close activities, including clinical trial accruals. The qualified candidate will manage our budgeting system Host Analytics and be an integral player in our budgeting, forecasting and long-range planning processes. A forward-looking, business improvement-minded, systems-savvy finance professional is highly desired. Ad-hoc financial analysis, Board presentation support, and business process improvement projects. B.A. or B.S. in business, finance/accounting or life sciences. M.B.A. is desirable. Demonstrated career and professional progression with at least 8+ years of recent experience in a FP&A or related role. Experience with Host Analytics and NetSuite desired. Knowledge of clinical development and CRO contracts as well as experience in partnering with Clinical Operations is highly desired. Systems-savvy with experience managing budgeting systems and reporting tools; systems implementation experience and knowledge preferred. Proven ability to proactively identify and solve problems and continuously improve FP&A processes. Demonstrated excellent written and oral communication skills, as well as thoughtful listening skills, to facilitate interaction with all levels of an organization. Strong modeling and analytical skills. Hands-on and results-oriented with an ability to manage various projects and meet deadlines. Flexible and able to adapt to a growing and dynamic organization with its frequently changing needs and priorities. CytomX is an equal opportunity employer. Employment decisions are based on merit and business needs. CytomX will not discriminate against any job applicant because of race, color, national origin, ancestry, gender, sexual orientation, age, religion, creed, physical or mental disability, gender identity, medical condition, pregnancy, marital status, veteran status, or any other characteristic protected by federal, state or local law.